Ain’t no quarter for an honest thief these days. Alex Farraday (Olga Kurylenko) learned this the hard way after refusing to kill witnesses who saw her face during a diamond heist. One way or another a group of “cleaners” arrive and methodically start to off her crew. Quickly realizing that such a response seems like overkill considering the crime, she discovers that they nabbed an extra goody that day at the vault: a disk drive containing treasonous secrets that could destroy the presidential aspirations of an unnamed American Senator (Morgan Freeman). So begins a deadly cat-and-mouse game between Alex and Mr. Washington (James Purefoy), a ruthless member of the “Agency” with no qualms about killing anyone in his way. 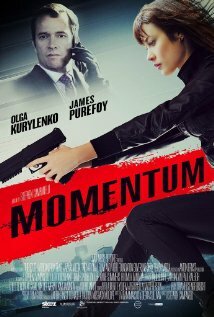 A simple plot, perhaps, but it gets the job done for Stephen Campanelli’s Momentum, a South African thriller that largely eschews massive action set-pieces in favor of intricate plotting and smaller scale battles between mere handfuls of people. Competently made, the film doesn’t really bring anything truly original to the table other than Purefoy’s turn as Mr. Washington. Hands-down one of the most compelling villains I’ve encountered so far this year, he blows Kurylenko out of the water, overshadowing her with effortless charisma propelled by a single-minded love for his murderous line of work. The bread-and-butter action scenes satiate the appetite but never blow the mind. Campanelli almost fumbles the car chase sequences with overly frenetic editing and camerawork. But mercifully they never reach the absurd extremes of Paul Greengrass or Olivier Megaton. Some of the plot twists stretch the audience’s suspension of disbelief, particularly one sequence where it’s revealed that Alex planned on getting a) clumsily captured, b) tortured, and c) allowed to live by the nearly sociopathic Mr. Washington so that she could lead him into a trap. Revelations like these demonstrate a common failing in modern action movies and thrillers: filmmakers believing that their work will only be remembered if they can pull the rug out from beneath their audiences à la The Usual Suspects (1995) or any of the Joker’s Gordian Knot-esque plans from The Dark Knight (2008). I’ve seen this tendency destroy otherwise wonderful action movies like Nadeem Soumah’s 6 Ways to Die (2015). Thankfully, enough of the twists in Momentum work that the egregious ones can be forgiven. However, Momentum violates two crucial filmmaking rules. First, never reveal the MacGuffin. The end of the film makes that mistake by showing the contents of the coveted disk drive: instead of gasps it elicits groans. Even worse, it forces the film to violate the second rule: never conclude a one-off film on a cliffhanger.